​This case history is taken from an actual case; "Harry T." is not his real name - it seemed kinder to keep the names of the real people & dog out of the story. "Harry" agreed that this is a pretty accurate interpretation of his tale. I found her wandering on the streets so I don't know how old she is or where she came from. Her background is a mystery, but she seemed very sweet and looking for someone to love. I did wonder why no one had claimed her. For the first couple of months, we didn't really have any problems. I thought she was perfect. Looking back, I can see some signs of trouble brewing but at the time, they didn't seem important. I guess it was all just so new to her that she was being extra good, extra careful in all her dealings with me. Now, I'm afraid of her. Her aggressive behavior is destroying our relationship and I don't know how to stop her. There was a little incident with the food bowl, but I let her know in no uncertain terms that her behavior was not acceptable. I guess she's pretty smart, because after that she let me do whatever I wanted to with the bowl whether there was food in it or not. We also had a "discussion" about the couch and the bed - it took a while for her to understand that when I was relaxing, she had no right to disturb me. She forgets every now and then, but I just yell at her a little and she gives up. We live in a pretty quiet neighborhood, which is a good thing. I don't think she'd be able to handle living in a city. I've lived in a city and can handle all the commotion and people and loose dogs, but I think she'd just flip out. Anyway, I take her for lots of walks every day - good exercise for both of us and sometimes I've just got to get out of that house and breathe some fresh air and clear my mind. On our very first walk, I had noticed that she was pretty high strung and it hasn't gotten any better. She seems to worry a lot. If a car is coming our way, she'll panic and drag me to the side of the road, making high pitched sounds and frantic motions. The best I can do for her in that situation is reassure her that everything is okay, though I'm not sure she even hears what I'm saying she's so excited. She calms down a bit, but I can tell that she's still pretty jumpy. The worst part of the walk is when we encounter someone on the street. She wasn't always like this - I think it started one morning when we were walking and we met this really rude teenager. I saw him coming a block away and figured he was probably going to hassle us a bit, but decided to ignore it if I could. As we got closer, I could hear him saying some pretty rude stuff. His body language was very insulting. When we tried to walk past him, he crowded right into us. Well, that was all I was going to take from this punk. I charged right towards him and began hollering and yelling like I was nuts. At first he yelled back, but then he got scared and ran away - I guess he figured I was a lot tougher than I looked. I was pretty proud of how I handled that punk until I looked around and there she was. Shaking like a leaf, eyes all wide with fear. I started towards her and, poor thing, she somehow thought I was going after her! She backed away from me, whining - I thought she'd pee on herself she was so scared! I crouched down, thinking that would reassure her, but eventually I had to lie on the ground and look totally harmless before she'd approach me. That was probably the first time I found myself really wishing she spoke my language so I could tell her that all my blustering and yelling wasn't aimed at her, and that while I wanted to scare the kid, I wouldn't actually have hurt him. I think she never expected that kind of behavior from me. After that, it just got worse. It's like she went nuts. It used to be that I'd see strangers coming before she did, and I'd say something quietly under my breath to let her know what was coming. Pretty soon, she was seeing them long before I did. Now, my first clues that a problem is brewing are her pulling on the leash for all she's worth and growling at me. I'll look up and scan the street and sure enough, here comes somebody. I don't know how to handle this, so I'll yell at her to calm down and then I'll start yelling at the stranger to back off, go away, vamoose! I ask them, "Can't you see how freaked out she is? Why do you keep coming closer?" The whole time, she's still hysterical. 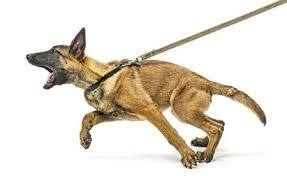 Let me tell you, when she starts hauling on that leash, it's really painful! And it's getting worse - fast. She used to just pull really, really hard on the leash and scream and make a lot of noise. But now she's attacking me! I'm starting to think that the only way to stop her is to inflict some pain on her to get her to listen to me. Last week, she started a whole new behavior. We were walking along when she saw a dog coming down the street toward us. I had just enough time to think, "Uh-oh, here we go again..." and start yelling at the dog when she leaped on me and tried to push me to the ground. I was so stunned I didn't even react - what could I say? She'd obviously gone crazy. I wasn't hurt too much physically, but my feelings were very hurt. Thanks to this new behavior where she pushes me to the ground, I'm beginning to really hate walks, at least with her. Even though I am very upset (and I'll admit, scared) by what she's doing, I've kept my cool and I haven't hurt her. I could, of course, since I'm much stronger than she, but that seems so wrong. After all, she's just a helpless creature. When she tried pushing me around this morning, I wrestled with her a bit and yelled a lot. I did threaten to hurt her, and that seemed to scare her enough and she stopped. But how much of this does she think I can take? And you know what really burns me? She seems completely bewildered by the fact that I don't want to spend a lot of time with her anymore. I mean, who would want to hang out with someone who leaps on you for no reason at all? Can't she tell that she's hurting me and scaring me when she does that? I know we speak two different languages, and that she only understands a little bit of what I say. But this is really destroying our relationship. What can I do with her? I'd hate to get rid of her - most of the time she's a pretty good owner. For more information on dealing with on-lead aggression, please see our article on this topic: Handling On Lead Aggression.